This data point highlights the importance students place on the flexibility of anytime, anywhere Internet shopping, and indicates that adding a competitive online component to your bookstore strategy could increase sales and overall utilization. If your college already has a bookstore website, or if you’re in the process of evaluating virtual bookstore options, you can secure an advantage over your current or future online competition by providing features that go beyond the basics to deliver the ultimate in convenience and a superior student experience. 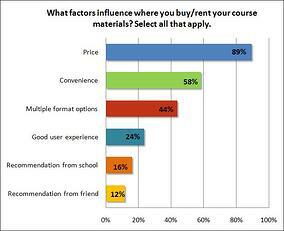 For example, 40% of students surveyed have used financial aid to buy or rent course materials, suggesting that it would be worthwhile to ensure your bookstore website enables students to seamlessly apply financial aid towards their purchases – a feature not offered by non-affiliated third-party sites. In addition, given that students are accustomed to using smartphones for viewing websites and making purchases - over 62% of our survey respondents provided their information using a mobile device – it’s advisable to ensure your online college bookstore is mobile-optimized so students aren’t inconvenienced by an awkward, frustrating user experience. Request a complimentary copy of our white paper to get more actionable recommendations for improving bookstore sales and view the complete results of our survey.